When Ken Peer saw that Stowe’s Red Basil Thai Cuisine had closed last fall, he jumped. A former restaurateur in his native Syracuse, N.Y., he thought the sprawling space would be perfect for a comfy, casual spot to invite the locals in for microbrews, burgers and the game. So he partnered with his childhood buddy Brian Krux and Chad Roy, former general manager of Burlington’s Das Bierhaus. Together they gutted the 19th-century building and added a 38-foot, copper-topped bar, 24 taps and some high-top tables, while capitalizing on its elegant feel. 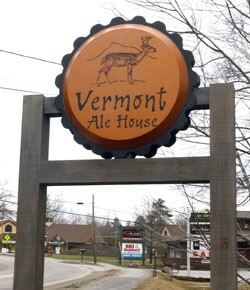 This week, Vermont Ale House will open at 294 Mountain Road. “We wanted to create a place for the locals,” Roy says, and the reimagined Vermont Ale House is full of nooks for hanging out. Just beyond the blood-red dining room is a “library” — a sunken, book-lined room with a brand-new fieldstone fireplace and two flat-screen televisions. Guests who get bored with the game — or with their companions — can pull a vintage Hardy Boys mystery or issues of Vermont Life from the shelves. The regular menu is decidedly more succinct: a handful of pub classics — such as “a really excellent hot-roast-beef sandwich,” says Krux — and wings finished on the grill. Seasonal ingredients will make their appearance in a rotation of daily specials. As for the beer, Roy kicks around a few local names. He says he became enamored of German styles while at Das Bierhaus, so visitors can expect a few behind the bar. Citizen Cider and kombucha will be on tap, too.